Japan March retail sales surged 11% to a 17-year record as shoppers rushed to buy goods before April’s sales tax increase from 5% to 8%. Analysts around the world welcomed the new, adding that any data pointing to a higher Japanese inflation rate is good news. According to the Ministry of Economy, Trade and Industry, retail sales totaled ¥13.731 billion in March, the eighth successive month of growth. Machinery and equipment sales increased by 37.5%, driven by very high demand for “white goods”, i.e. washing machines, refrigerators, freezers, etc. Sales of TV sets and computers also did well. Automobile sales rose 9.4%. Japan, which has the largest public debt among the advanced economies – approximately 230% of GDP (gross domestic product) – raised its sales tax (consumption tax, VAT) in a move to address its debt. Economists say the higher sales tax will increase prices, which would be a welcome move towards the central bank’s target of 2% annual inflation. Is this the start of a Japanese rebound? For the last twenty years, the country has been battling falling prices – deflation – and the economic problems that come with it, such as weak GDP growth, poor job creation, and low borrowing. During a period of deflation consumers and businesses postpone purchases because they expect to get better deals later on. Ending this cycle of falling prices, low consumer/business spending, and weak economic growth has been Prime Minster Shinzō Abe’s top priority. Before taking office at the end of 2012, Abe, who had been prime minister for one year in 2006/2007, announced plans to kick-start Japan’s economy out of nearly two decades of deflationary stagnation. After impressive GDP growth in the 1980s, Japan’s economy slid into a deflationary standstill, with poor growth and low consumer spending, despite several attempts by various administrations to kick-start the economy. Abenomics is a high-spend, Keynesian-inspired economic plan that takes a 3-arrow approach to boost the economy with structural, fiscal and monetary policies. It includes a program to create 600,000 jobs over a two-year period. Some of Abe’s measures have had a positive impact and consumer prices have been rising. According to preliminary data, Tokyo’s April (annualized) inflation rate came in at 2.7%, the highest price increase in over two decades. Tokyo’s inflation data is generally seen as an indicator of nationwide price rises. National inflation data for April will be released in May. 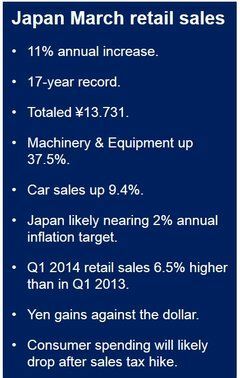 Since the beginning of the year, economic data coming out of Japan have been mixed. Since the beginning of the year, economic data coming out of Japan have been mixed. March’s trade deficit quadrupled compared to March 2013. March’s trade deficit quadrupled compared to March 2013. Industrial production in February 2014 fell 2.3% versus February 2013. Q1 2014 GDP growth was just 1% (annualized), driven by weak capital spending, low private consumption, and disappointing exports.